Seems like not too long ago I was thinking how was I going to start off doing scroll saw projects. As I sit here and contemplate this, there are various details I could get into about my start in scroll sawing. My thoughts turn to more specifics in my beginnings in scroll sawing and I have come up with some tips for beginners on scroll saw projects that I think could be helpful to the beginner. These tips are in regards to items I had to think about as a beginner when I started out doing scroll saw work. When starting out in scroll saw work, I knew I needed to think about the scroll saw I was going to use. Additionally, I suspected that I would need some new accessories to make things easier for my projects. Once I got all that I needed, I then would have to determine what skill level I might be able to perform at. This meant what scroll saw patterns could I use to start my new hobby, what type of wood should I start out with. Lastly I have to think about the space and the environment to work on my projects. Let me go into a bit more detail on these items. Picking a scroll saw was no easy task for me. You think that you would just find one and start working on your scroll saw projects. But for me I found in choosing a scroll saw, price along with reliability were the key points I focused on. After I purchased my scroll saw, I found that the depth of the arm and ease of use was something important to me as well. I also liked the thought of the variable speed. The depth of the arm is sometimes referred to as the throat size and depth seemed important for larger projects. In the end it was a choice between the WEN 16 inch or the DeWalt 20 inch, though I did like a few others. Both seem to have great reviews on them and were the ones most purchased. The big difference here was the price. We’re talking several hundred dollars, which is a big difference. I ended up choosing the DeWalt. I think I had a little tax return money burning a hole in my pocket, but I can’t help but think I would have been able to accomplish the same projects had I picked the WEN. I do love my DeWalt though. The 20 inch is very nice for larger projects. Getting the blades in and out is fairly easy. The variable speed is very nice as well. Taking a little time to choose your tool is not a bad idea and I am happy it worked out and I love the Dewalt scroll saw. Picking a good scroll saw will be very important when it comes to starting out on your beginnings as a scroll saw hobbyist. A good scroll saw will mean a good scroll saw experience and good scroll saw projects. I advise you to take a little time on this one as a beginner and I highly recommend you read user reviews before purchasing your scroll saw. 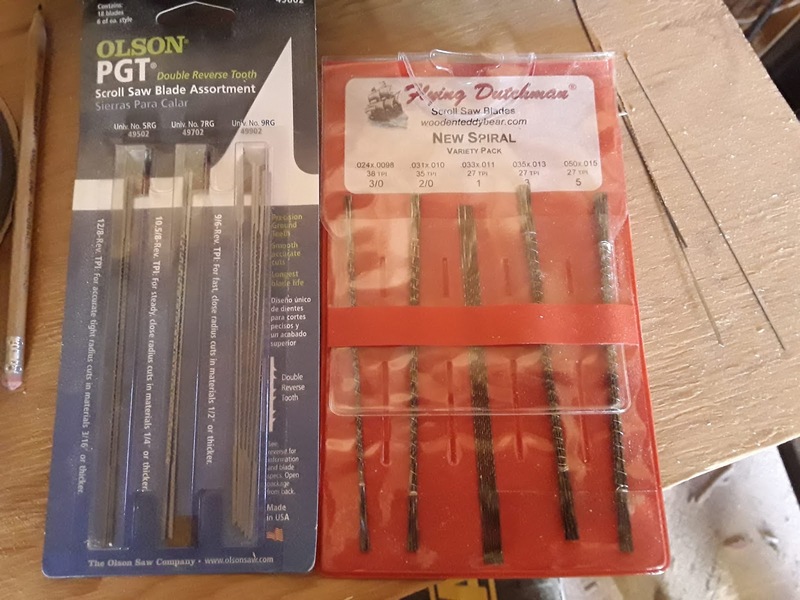 My scroll saw came with a couple of starter blades, of which seemed to wear out after a couple of projects. I did purchase some blades when I got my scroll saw but I really did not know what I needed to get started. Let me just tell you that there are various different sizes to choose from. They range from smallest #2/0, #0, #1, all the way to #12. The size you use is in relation to the thickness of the wood you intend to cut. The smaller the blade the less thick the wood should be. I have been quite partial to the smaller blades as they have more precision, and I find myself at times using a smaller blade on a little thicker wood than recommend. A few of my first projects were with a single sided blade from Olson Saw, a very good starter pack of blades. I would cut, then turn the wood and cut, and continue from there. Then I found that they make spiral blades! I picked up some Flying Dutchman spiral blades at a good deal with 5 dozen blades. I can cut in any direction without having to rotate my project to the direction I wish to cut. The spiral blades were a bit more difficult to control as you can accidentally move slightly in any direction and start cutting, though I have to admit it may be hard for me to go back to a single sided blade again. I want to make a special note here about attaching your blade to your scroll saw. I can’t count how many times I have put the blade in upside down. When you fix your blade onto your scroll saw, even the spiral blades, remember to always face the teeth downward. I have actually completed projects with the blade upside down, so I know it can be done, but then I realize I need to do a bit more sanding on the front of my project because I did have the blade upside down. You may find that you are getting more board jumping with the blade in upside down. This can be a good indicator to check to make sure the blade is in correctly. There are two types of blades out there. Pinned blades and Pin-less blades. This should be an additional thought when buying a scroll saw. Though I don’t know that I was paying as much attention to this as I should have been. I don’t know that people really think to much about accessories for a scroll saw, but I did find that I was interested in a lamp and a stand. The lamp unfortunately was an additional cost to the DeWalt scroll saw. Some scroll saws will have the lamp come with it when you purchase it. You can likely buy any type of extra lighting source you feel you need and don’t need one that attaches to the scroll saw itself. I felt that the Dewalt lamp would help put light on my projects a lot better than the normal room light, and sure enough it really helps me. I might think that some may have a brighter room than I and will not actually need a lamp. There was a stand that I could purchase where my DeWalt scroll saw was supposed to fit (Dewalt Scroll-Saw Stand). It was a choice of making my own, setting it on a table, or buying the stand. I chose to buy the stand and I don’t regret it. I works nicely and I can even attach it to the floor if need to. A good pair of goggles or protective glasses can be a good thing to buy as well. Additionally, they do have some magnifying glasses that can really help out people such as myself whom have less than perfect vision to be able to see your cutting a bit better. I want to lastly mention scroll saw paper. Many people have other methods of attaching their patterns to the wood but I can say that I love using the scroll saw paper. I got my scroll saw paper at Amazon here: 20′ Roll – 8-1/2″ Stick N’ Release Scroll Saw Tape . This scroll saw tape has been by far one of the better choices for me in my scroll saw projects. It just simply makes things much easier. Accessories are definitely something to consider, though you may not know entirely what you need until you start your first few projects. So when I finally started on my first project I had to choose some of my first patterns. The internet is full of patterns and examples for sure. In fact I had a The Winfield Collection company start sending me a small magazine or two full of patterns and designs I could purchase after I had bought some scroll saw paper. (Don’t you just love when companies take advantage of your information. In this case I don’t mind as I like looking at all the ideas). For me I decided to go with some more moderate patterns as well as a few simpler patterns. I’ve done a bit of wood working in my past so I felt that starting out with something a little challenging might be a good idea. One of the patterns I chose was a frog pattern. I have to quickly apologize to anyone that sells patterns or images for wood working. If you post a picture of it, I can manipulate it, copy it, and do whatever I need to start a scroll saw project with it. I don’t know that I will ever pay for too many scroll saw patterns in my lifetime and I apologize to those selling them. The frog pattern is such an example. I did retrieve it from the internet and manipulate slightly to my liking and I thought it looked pretty good. I think finding some good patterns to start with that you feel is in your capabilities is key in starting out in creating your first scroll saw projects. I don’t know why but I find that I do a lot of work with pine wood. I think over time it has just been more readily available, cheaper and easy to work with. Not to mention it can look really good. So far I have tried scroll saw projects on pine, oak, and birch. My absolute best experience was with a project on oak. Unfortunately this is a fairly expensive wood as well. I did an American Indian image for my father in law and I tell you the wood just cut nicely, it was a crisp image after it was complete, and oak just seems to take a gloss finish better than any other wood I have used. I created a birch wood project with humming birds for my mom. This was by far a bit more difficult wood for me to work with. The wood was very soft, which allowed for flexibility when doing tight cuts, but that is not always a good thing if you make some unexpected moves in your cutting, say due to finger fatigue. Also birch did not take a very good gloss finish. Additionally I had the wind upend the project onto the ground during drying and the feathers on one of the wings broke off. (Nothing a little wood glue could not remedy). I think the type of wood will be entirely up to the wood worker. I suggest trying out a few types of wood to get a feel for what you like. I don’t know about most people but when it comes to environment in creating my wood working projects, I like space. Lots of room to work with. Surly I did not expect anything less when I picked up scroll saw wood working. I work in a 200 sq ft. space that at times still feels like I need more room. I like to sprawl out my tools and have them ready for access when I need them. Of course this can be bad for me sometimes as I on occasion misplace something. I eventually find that item underneath something else or when I wandered off from my work area I set that item down to do something and forgot to pick it back up again. Having nearby tables next to my scroll saw has been quite beneficial for me. When I am at my scroll saw it is nice to be able to turn and have access to putting something down or picking something up from a nearby table. 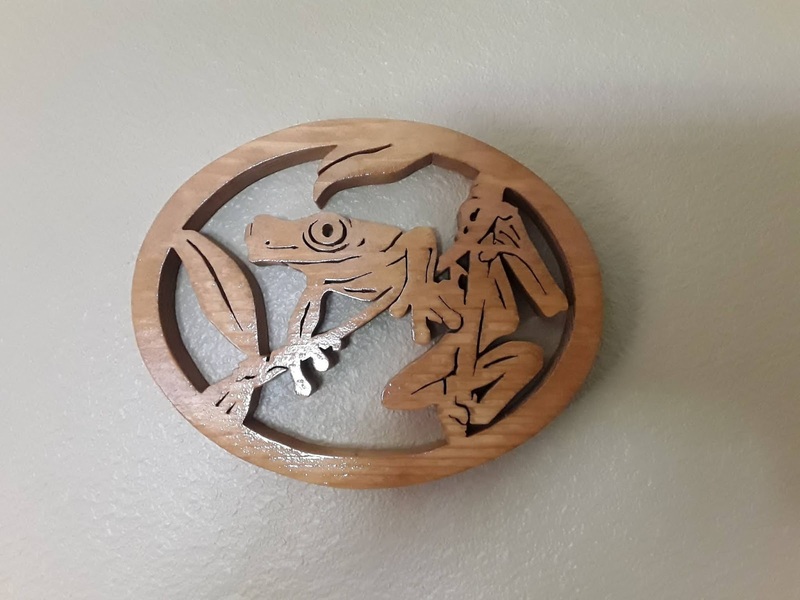 In any case giving myself a good working environment according to my needs has been extremely helpful for me, and I think it helps quit a bit in the outcome of my scroll saw projects. As I have indulged in my new hobby for some time now I am happy with the scroll saw purchase along with the accessories that I got with them. The work environment I have created for myself seems to be working out very well for me and I am loving creating my scroll saw projects. Each new pattern I work with seems to gain me more experience as I go along. I have worked with a few different woods and intend to find some more varieties out there to work with. As now I know if I limit myself to just a few types of wood, I will miss out on something cool, I just know it. Scroll Saw Blades: Choosing Your Scroll Saw Blades – This goes into more detail about scroll saw blades. 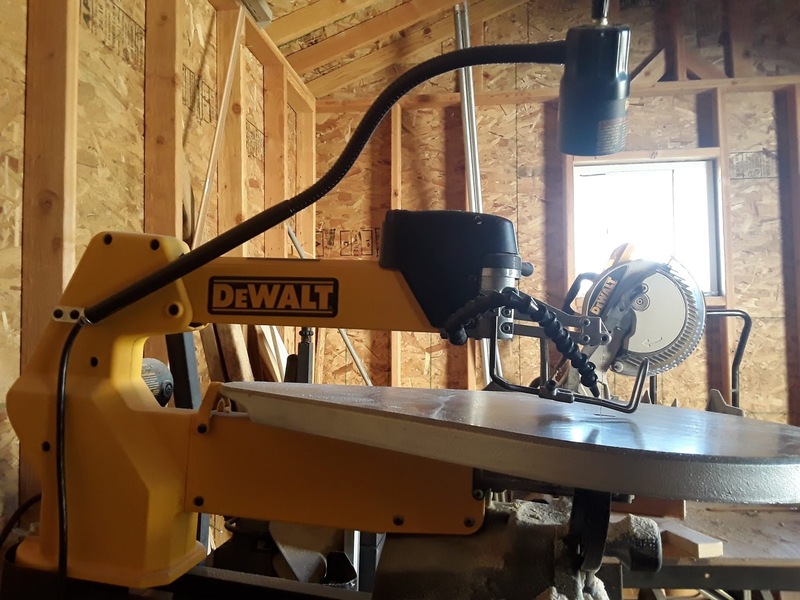 10 Things I Needed to Set up my Scroll Saw Workshop – I go into detail about how I set up my scroll saw workshop. 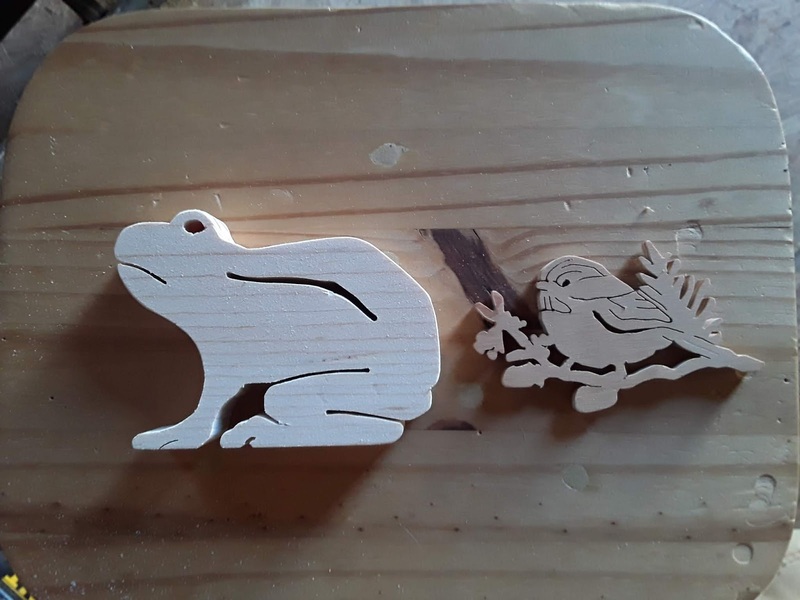 Intarsia Wood: Tips and Uses of Various Woods – Some information about some of the different types of wood that can be available not only for Intarsia but for scroll saw projects. I hope I have been some help for anyone reading this article on starting into scroll saw projects. Being a beginner can be a little daunting in any wood working project, and if you are like me, you want to get it right the first time, as much as humanly possible that is.